SACRAMENTO – California Secretary of State Alex Padilla reported today that there were nearly 200,000 completed transactions on the California Secretary of State’s online voter registration website on Monday, May 16 and Tuesday, May 17. This spike coincided with a new Facebook effort to facilitate voter registration in California. 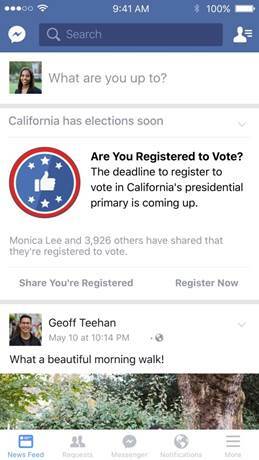 On Monday, May 16, 2016, Californians who logged into their Facebook accounts began receiving a reminder to register to vote through a link appearing at the top of their News Feed. “Monday’s registration activity was the second highest in the nearly four year history of California’s online voter registration site,” said Secretary of State Padilla. “We appreciate Facebook’s commitment to increasing voter registration in our state. The power of social media to connect Californians to online voter registration was on full display,” Padilla said. On Monday, 143,255 registrations or updates of registration information took place on the Secretary of State’s online voter registration site. On Tuesday, another 56,717 registrations or updates of registration information were completed through the voter registration website. The online activity showed that approximately 33.55% of these transactions were completed by Californians ages 17-25. And, about 29.23% of these transactions were completed by Californians ages 26-35. May 23 is the deadline to register for the June 7, 2016 Presidential Primary Election. “If you've moved, changed your name, or want to change your political party preference simply visit RegisterToVote.ca.gov by May 23," Padilla added. The Facebook reminder post included a link to take users to Vote.USA.gov—a federal site with voter registration resources. This site redirects California users to RegisterToVote.ca.gov via a pulldown menu. This reminder ran from May 16 through May 18, 2016, and went out to Facebook users in California who will be 18 or older on Election Day.